This event aired I assume on niconico so it is shown in full! For better or worse. The show begins with one of my favorite little wrestlers. Kaho Kobayashi wrestles in a bunch of promotions, as I mentioned above she announced that soon she will be taking an extended excursion to Mexico and I will miss her. 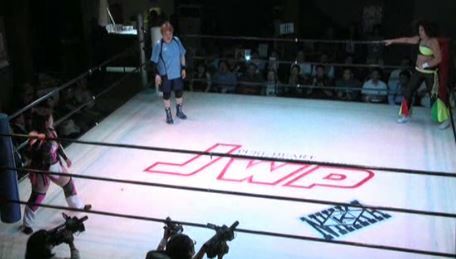 Fujigasaki is a young JWP wrestler, she is only 19 years old and still is working her way up the card very slowly. Kaho starts with some arm work on the JWP youngster, Fujigasaki gets a headlock applied before knocking down Kaho with a shoulderblock. Springboard armdrag by Kaho and she dropkicks Fujigasaki in the corner, another dropkick by Kaho and she covers Fujigasaki for two. Kaho stomps down Fujigasaki and goes for a slam, Fujigasaki blocks it at first but Kaho eventually manages to get the scoop slam. Running sentons by Kaho, and she covers Fujigasaki for two. Dropkick to the back by Kaho but Fujigasaki levels her with a hip attack, Fujigasaki throws down Kaho by the hair a few times before hitting a facebuster. Camel Clutch by Fujigasaki and she then puts Kaho in a stretch hold, cover by Fujigasaki but it gets two. Fujigasaki puts Kaho in the ropes and dropkicks her in the back, she put Kaho in a single leg crab hold but Kaho gets to the ropes. Scoop slam by Fujigasaki but Kaho quickly rolls her up for two. Dropkick by Kaho and she hits another one, fisherman suplex by Kaho but Fujigasaki kicks out. Kaho goes up top and hits a missile dropkick, Fujigasaki gets up quick however and hits a missile dropkick of her own. Double wrist armsaults by Fujigasaki but Kaho reverses the last one into a guillotine choke. Fujigasaki hits a final armsault anyway, she slams Kaho in front of the corner and goes up top but Kaho avoids the diving swivel body press. They trade quick pins with no luck, they return to their feet and trade elbows both and forth. Fujigasaki wins the elbow battle and puts Kaho in a stretch submission, she releases the hold and delivers the swivel body press but Kaho barely gets a shoulder up. Fujigasaki drags Kaho up but Kaho quickly rolls her up for two, Kaho goes off the ropes but Fujigasaki nails the hip attack. Fujigasaki picks up Kaho but Kaho hits an enzuigiri, 120% Schoolboy by Kaho and she gets the three count! Kaho Kobayashi is the winner. 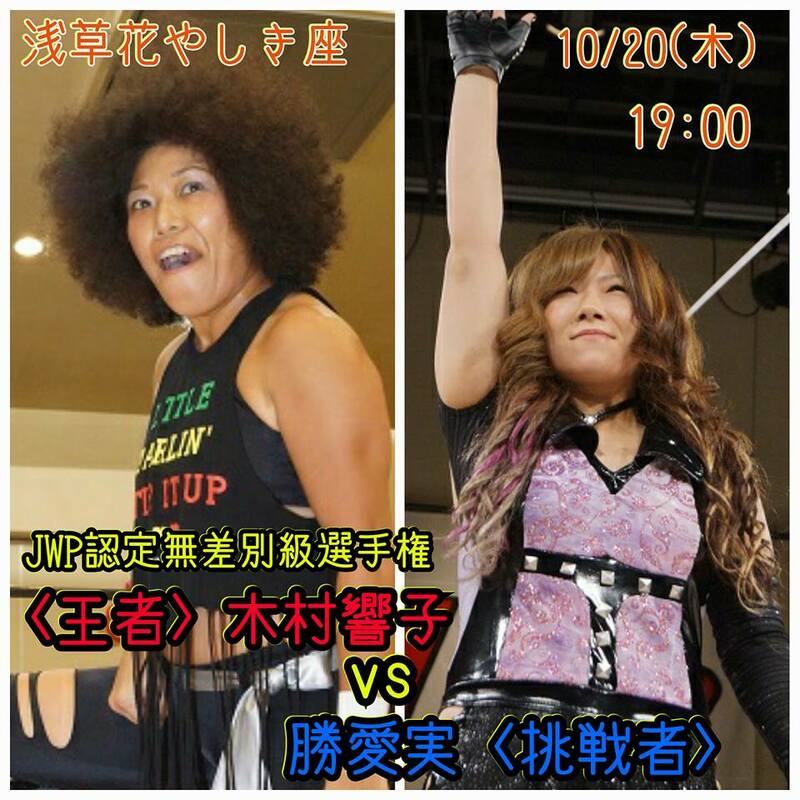 Similar to the last match, this one also pits a young wrestler (Kyuri is 18) against a veteran. The roles have switched however, as in this match the JWP wrestler is the seasoned vet. Kyuri is an Ice Ribbon wrestler in her third year, while Leon has been wrestling for over 15 years. Leon hasn’t lost a step so it will be an uphill battle for Kyuri in this one. After some mat work, Leon gets the first advantage as she throws Kyuri around the ring before hitting a dropkick for a two count. Scoop slam by Leon and she hits a somersault senton, camel clutch by Leon and she lets go so she can stomp Kyuri in the back. Leon goes off the ropes but Kyuri hits a judo throw, she applies her own camel clutch but Leon quickly gets out of it. Leon chops Kyuri in the corner and delivers a dropkick, but Kyuri hits a series of jumping neck drops. Kyuri goes for a cross armbreaker but Leon blocks it, triangle choke by Kyuri but Leon powerbombs out of it. Backstabber by Kyuri and she applies an armbar, armbreakers by Kyuri but Leon blocks one and applies a sleeper. Kyuri tosses Leon to get out of it and hits a dropkick, she goes up top and hits a diving crossbody. Fisherman suplex hold by Kyuri, but it gets a two. Kyuri goes off the ropes but Leon catches her with a tilt-a-whirl backbreaker, she picks up Kyuri but Kyuri rolls her to the mat and applies a Stretch Muffler. Leon rolls out of it and applies a stretch hold over her back, spear to the back by Leon and she hits a missile dropkick. Cover by Leon, but it gets a two count. She goes for another one but Kyuri avoids it, Figure Four with a bridge by Kyuri but Leon kicks out of it. Kyuri picks up Leon and applies a rolling ankle hold, she picks Leon back up but Leon hits a tilt-a-whirl slam for two. Texas Cloverleaf by Kyuri but Kyuri crawls to the ropes and forces a break. Stomps by Leon and she goes for a Capture Buster, but Kyuri reverses it with a schoolboy. Kyuri goes off the ropes but Leon spears her, she goes for another spear but Kyuri reverses it into a roll-up. Kyuri goes up top but Leon joins her and suplexes her to the mat, she goes back up top and she nails the Mad Splash for the three count! Leon is your winner. It is crazy seeing someone as little and young as Kyuri going for MMA moves, it didn’t fit her playful look at all. She needs to upgrade to a more serious outfit now that she is 18 and using a different style. The match was fine but really back and forth with little structure to it, sometimes the wrestler in control switched for no real reason. The moves were all hit crisp so no complaints there, very smooth match and Kyuri is certainly coming along. Not a bad match, just lacking anything to make it special. I am really interested in this match as I have not been particularly impressed with either wrestler in the past. Nakamori is a ten year veteran in JWP but struggles in matches where she isn’t against someone great, she is a bit awkward and forgettable. Natsu is only in her third year but has never impressed, she lacks confidence at times and like Nakamori doesn’t leave an impression. So either this match will be really bad, or one of them has improved since I last saw them. Natsu starts the match trying to knock over Nakamori with dropkicks but she has no luck, as instead Nakamori throws down Natsu by the hair. Natsu returns the favor but Nakamori throws down Natsu again, she goes off the ropes but Natsu connects with a dropkick. Nakamori and Natsu trade strikes, kicks to the leg by Nakamori and she hits a PK followed by a leg drop. Nakamori picks up Natsu and puts her into the ropes, kicks to the chest by Nakamori and she puts Natsu in a camel clutch. Irish whip by Nakamori but Natsu hits a jumping crossbody, headscissors by Natsu and she hits a few push up facebusters. Nakamori gets into the ropes to force a break, Natsu goes off the ropes and she boots Nakamori in the head. Natsu puts Nakamori in the corner but Nakamori Irish whips her into the other corner and kicks her repeatedly. Irish whip by Nakamori but Natsu avoids the big boot, back elbow by Natsu and she hits a seated senton. Natsu goes off the ropes but Nakamori hits a jumping lariat, picking up a two count. Running kicks by Nakamori but Natsu hits a jumping lariat, Natsu puts Nakamori in a choke before hitting a Reverse DDT. Natsu picks up Nakamori and hits a series of elbows, but Nakamori hits a release German. Running boot by Nakamori, she goes up top and she hits a missile dropkick for two. Fisherman Suplex Hold by Nakamori, she goes up top but Natsu joins her. Natsu kicks Nakamori off the top turnbuckle and down to the floor, she goes out after her and elbows Nakamori against the apron. Jumping elbow by Natsu and she slides Nakamori back into the ring, she goes up top and hits a diving crossbody for a two count. Natsu picks up Nakamori and hits a bridging scoop slam, but that gets a two as well. Natsu picks up Nakamori again but Nakamori blocks the powerbomb and kicks Natsu against the ropes. They trade big boots, enzuigiri by Nakamori but Natsu quickly rolls her up for two. Big boot by Natsu, she goes off the ropes but Nakamori boots her in the head for a two count. Shining Wizard by Nakamori, she goes up top and she hits the Destiny Hammer for the three count! Hanako Nakamori wins the match! While Natsu appears to have improved a bit, still same ‘ol Nakamori. She isn’t a bad wrestler, she is just awkward and her strikes aren’t good. They seemed generally on the same page aside from one particularly awkward moment, but it was just really ‘back and forth’ with mostly big boots. Natsu showed some passion which is a plus, a pretty average match overall though and quite skippable. Nothing like a big midcard tag match with all the wrestlers that didn’t have anything else to do. All the wrestlers here are JWP wrestlers except for Kansai, but since Kansai is retiring soon she is making the rounds to most other promotions so everyone gets a chance to see her before she does. Miyu and Bolshoi do team from time to time as do KAZUKI and Hagane, so some thought was put into it even though there is really nothing at stake. This is the type of filler I’d normally skip, but for reviews I try to watch everything and I do enjoy some of the wrestlers here, so I will try to stay optimistic. Hagane and Miu begin the match, Hagane quickly goes on the offense and slams Miu to the mat. She tags in KAZUKI who keeps on Miu, but Miu gains the advantage and tags in Bolshoi. Rope walking armdrag by Bolshoi and she stretches KAZUKI on the mat. KAZUKI escapes and tags Nakajima, Nakajima and Bolshoi end up on the mat and Nakajima goes for a cross armbreaker. Bolshoi blocks it and applies a crab hold, she tags in Kansai and Kansai suplexes Nakajima for a two count. Chinlock by Kansai, Bolshoi comes in and she dropkicks Nakajima in the face. Kick to the chest by Kansai, Nakajima fights back with her own running boots and finally a dropkick sends Kansai on her back. Nakajima picks up Kansai but Kansai gets to the ropes when Nakajima goes for a suplex. Claw Hold by Kansai, KAZUKI runs in so she puts her in a Claw Hold too. She lets go after a moment and hits a double lariat before tagging in Miu. Miu footstomps Nakajima and puts her in a stretch hold, kicks by Nakajima but Miu hits a missile dropkick. Vertical suplex by Miu, and she covers Nakajima for two. Miu goes off the ropes but Nakajima boots her in the head, she goes off the ropes and hits a sliding kick. Nakajima goes up top and delivers a missile dropkick, picking up a two count. Waistlock by Nakajima but Miu elbows out of it, she goes off the ropes but Nakajima catches her with a bridging fallaway slam. Nakajima tags KAZUKI, gutbuster by KAZUKI and she covers Miu for two. Double kneedrop by KAZUKI, Hagane and Nakajima run in and they all hit running footstomps onto Miu. KAZUKI puts Miu across the corner and hits a double kneedrop, reverse splash kneedrop by KAZUKI and she covers Miu for a two count. Miu slides away from KAZUKI, Bolshoi hits KAZUKI from the apron and Miu rolls her up for two. Sliding D by Miu, she goes up top and hits a missile dropkick. Miu tags Bolshoi, DDT by Bolshoi and she covers Miu for a two count. Knee by Bolshoi but KAZUKI knees her back, Hagane and Nakajima come in but Bolshoi takes care of all three of them. Miu also comes in to help, Kansai then comes in and Team Bolshoi all apply submission holds. After they released the holds, KAZUKI quickly fights back and Bolshoi and makes the hot tag to Hagane. Shoulderblock by Hagane and she hits a powerslam, picking up a two count. Reverse Splash by Hagane, but that gets a two as well. She goes up top but Bolshoi avoids the diving body press, La Magistral by Bolshoi but KAZUKI gets a shoulder up. Bolshoi tags Kansai, high kick by Kansai but Hagane lariats Kansai for two. Backdrop suplex by Kansai, but the cover is broken up. Kansai tags in Bolshoi, KAZUKI runs in as things back down. KAZUKI is isolated, Tiger Feint Kick by Bolshoi and she hits a palm strike. Bolshoi goes for a headscissors but KAZUKI blocks it into a backbreaker, Miu comes in and suplexes Bolshoi, then Hagane levels her with a lariat. Hagane picks up Bolshoi but Bolshoi whips off a hurricanrana, she goes off the ropes but Hagane hits a hard lariat. Hagane goes up top but Miu and Kansai run in to help. Splash Mountain by Kansai to Hagane, Bolshoi picks her up and she delivers a Tiger Suplex Hold for the three count! Bolshoi, Kansai, and Miu win the match. Normally I am pretty talkative but there isn’t a lot to say about this match. It had some good wrestlers with some good action, but is just an incredibly forgettable match. There was little structure or rhythm, and neither team seemed to have a plan to win (or a real reason to care if they won). It wasn’t poorly worked, no mistakes or miscues, it just wasn’t overly inspired. Just a standard midcard multi-wrestler tag match. This was the scheduled main event of the evening, even though it didn’t turn out that way. The soon retiring Kyoko Kimura won the JWP Openweight Championship from Arisa Nakajima on October 9th, and this is her first defense of the title. Coming into the match, Manami Katsu had only won Jr. Championships so she wasn’t a strong challenger, however she did beat Yako Fujigasaki and Rydeen Hagane to at least somewhat earn the match. JWP doesn’t have a ton of wrestlers, it doesn’t take much to earn a title shot. This is the biggest match in Manami’s career up to this point, so I am sure she will bring everything she has. Kyoko quickly takes the young challenger to the mat and controls the early portion of the match, Kyoko stomps on Manami and elbows her hard into the ropes. Kyoko throws Manami into the corner but Manami avoids her charge and hits a strong elbow followed by a dropkick. Manami goes up top and hits a missile dropkick, Manami applies a double underhook but Kyoko tosses her way out of the move attempt. Back up they trade elbows, Manami knees Kyoko in the back and she hits the double underhook into a backbreaker for a two count. Crab hold by Manami but Kyoko gets out of it and applies a crab hold of her own. Manami reverses it into a roll-up for a two count, Kyoko gets Manami’s back and applies a sleeper but Manami eventually gets to the ropes to force a break. Stomps by Kyoko but Manami hits a quick Inazuma Buster (Michinoku Driver), leaving both wrestlers on the mat. They slowly get up and trade elbows, they go off the ropes and Manami delivers a running knee to the chest. Manami gets on the top turnbuckle and hits a diving elbow drop, covering Kyoko for two. Manami picks up Kyoko and hits another Inazuma Buster but Kyoko gets a guillotine choke applied. Kyoko picks up Manami and delivers a side suplex, cover by Kyoko but Manami bridges out of it. Kyoko goes up top but Manami recovers and joins her, elbows to the back of the head by Manami and she hits an avalanche Tiger Suplex. Cover by Manami, but Kyoko kicks out. Manami goes for the Orange☆Blossom but Kyoko headbutts out of it, another headbutt by Kyoko and she covers Manami for two. Back up, chops by Kyoko and she goes off the ropes, but Manami catches her with a spinning back elbow. Manami goes off the ropes but Kyoko nails a big boot to the head, and she picks up the three count! Kyoko Kimura is still the champion. Even though my description of what happened above is short, it was actually a pretty long match at over 21 minutes. Just not a lot happened. Manami never really felt like she was a legitimate challenger, she got in a few good moves and nearfalls as you’d expect in a title match but she never strung together enough offense that I thought she had a chance of winning. Kyoko didn’t give Manami much, she dominated the mat work and 90% of the strike work, and put away Manami after just one big boot when generally in bigger matches it takes a couple of those for her to pick up the win. It never really felt like a title match, overall just a bit flat and uneventful. On paper this was the end of the show, but Rabbit Miu gets in the ring and grabs the microphone. I don’t know what she said exactly, but I assume she challenged Kyoko to a title match and Kyoko accepts. Like Manami Katsu, Rabbit Miu has only won Jr. Championships in her career and hasn’t really gotten past the midcard in her four year career. She is very small, about 4’7″, and is a solid hand but not much more. But like I said above, JWP doesn’t have a lot of contracted wrestlers so the bar isn’t too high to get a title shot. Miu last challenged for the JWP Openweight Championship on October 25th, 2015 when she lost to the champion Mayumi Ozaki. Miu smartly goes right after Kyoko since she is still a bit tired from her previous match, Miu rolls up Kyoko a few times but Kyoko kicks out. Elbow Smash by Miu and she hits a series of footstomps, she goes up top but Kyoko avoids the diving footstomp. Kick to the knee by Kyoko but Miu fires back with elbows, German Suplex by Miu but it gets two. Miu goes to the top turnbuckle and nails the diving footstomp, she picks up Kyoko and delivers the Rabbit Suplex for another two count. Elbows by Miu but Kyoko hits a Chokebomb, leaving both wrestlers hurt on the mat. Kyoko boots at Miu’s head, she picks up Miu and goes for a sleeper, but Miu rolls out of it and hits a running Rabbit Roll for a two count. She goes for another Rabbit Suplex but Kyoko blocks it and hits a shoulder backbreaker. Side suplex by Kyoko and she puts Miu in the Kimura Lock, Miu struggles for a moment before she has to submit! Kyoko again retains her championship! From top to bottom this was just an uninspired show by JWP. Part of the issue is that two of their better home talents, Arisa Nakajima and Command Bolshoi, were stuck in a rather meaningless six wrestler tag match in the middle of the card. Kyoko/Manami could have been used to build up Manami but I don’t think it did that at all, as Kyoko controlled the match and much of it was too pedestrian for a title match. The opener and the final main event pushed the card up a little, but neither were long and weren’t enough to save the event as a whole. JWP can put on entertaining cards, this just wasn’t one of them.